The Brittany (also known as the Brittany Spaniel or Epagneul Breton) is the national dog of France. (Epagneul is a French word given to dogs that point or set their game, while a Breton is from Bretagne or Brittany). This dog originates from the French province of Bretagne, a rugged peninsula or land surrounded by the English Channel on one side and the Atlantic Ocean on the other. Prior to the invention of firearms, these were a ‘drop on point dog’, which allowed a net to be cast over both them and the game that was being hunted. In the 1850s English sportsmen brought with them to Bretagne their sporting guns and well trained pointers and setters, which they bred with the local dogs. These were later crossed with the Braque (a French pointer). At some point a tailless dog was born. This characteristic was seized upon as a distinctive feature in the breed's early development, and even today some Brittany are born tailless. 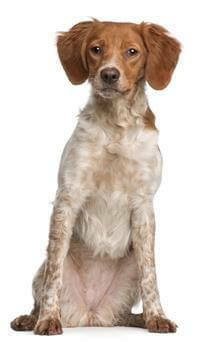 Brittany Spaniels will usually live to 12 years, but cared for with the right nutrition can live up to 14 years of age. The female is usually 13kg and 47cm tall and the male is 16kg and 50cm tall. Although the Brittany was developed as an active hunting dog, it is also biddable and gentle, and almost placid in nature. Generally very good with children, they make a great family dog. The breed is characterised by ‘the maximum of quality in the minimum of size.’ Despite being a small, compact and elegant dog, it is noted for its endurance, stamina and tenacity. Although traditionally a hunting breed, it is required to come out of the field and into the show ring with a minimum of grooming. This breed will hunt all day and be ready to go again and again. Keen, alert and intelligent, the Brittany is overflowing with boundless energy. The Brittany gets on well with other dogs as they help to keep them entertained, plus provide companionship when its owner is not around. Essentially these dogs were developed and bred to hunt birds and that's exactly what they will do, given the opportunity. However if they are brought up from puppyhood with other pets, they will readily learn to accept them. Give your dog a brush and a bath as required. Feed a quality balanced diet as this breed is very active and depends on good nutrition to fuel its athletic lifestyle. If used as working and hunting dogs, Brittany's should be wormed twice as often as normal (i.e. every six weeks). Grass seeds can also present a problem, so paws should be checked regularly. Prospective owners need to be made aware that this is an extremely active dog which needs a great deal of physical and mental exercise, otherwise it may develop destructive tendencies.